VMV’s Skintangible is the brand’s BB cream. In the box it actually says BBBB (Beauty Balm But Better) cream. According to the bottle label, VMV’s Skintangible is a “barely there non-makeup that is subtly light and natural-looking.. it evens out the skin tone and imparts a soft glow + dewy finish. After using it though, I find it more similar to CC creams, or “color correcting” creams, that are known to address redness or sallowness, and usually have less coverage than BB creams and foundation. Whatever it is–BB or CC, or what have you–it hardly matters because to me, it’s definitely one awesome product! I love makeup, but my skin is very sensitive and choosy. I can’t just put on anything because I tend to breakout. I’m also very oily. 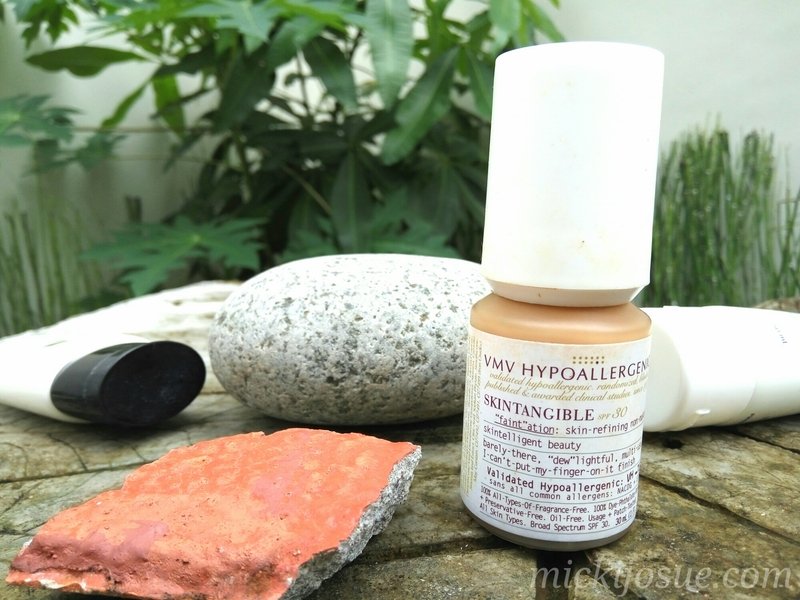 I have to be careful and use products that can stand the insane Philippine weather and my naturally oily face. So for my everyday base, I prefer to stick to light coverage that is non-greasy, doesn’t clog pores, is gentle, and is proven safe and hypoallergenic. This concoction has proved to be the best thing for me to date! It has just the right amount of SPF (SPF 30), it evens out my skin tone, and it has that barely there finish–which I love so much, btw! The consistency is smooth and creamy. It doesn’t make me break out either, and it holds all day. It has no smell too! It’s also easy to build on when I need to have more coverage because it can act as a primer. When I attend weddings or events I just add foundation over it. For those who want a simple and easy product that covers all the basic skin necessities and looks natural, grab a bottle of this A.S.A.P. I’ve been using it since 2013 and have not let go since.I really love the sheer finish and how it just sits subtly ontop of my skin. I’d just like to point out that if you have visible blemishes, this won’t cover it because as mentioned, it’s very light. You’ll need a concealer. There’s a 12g bottle that’s perfect for trying it out the product, and there’s a 30ml bottle for when you decide to add it to your daily routine. I actually have both. I keep the small bottle in my makeup kit which is with me all the time. Skintangible is also relatively affordable compared to other products of the same nature. The last time I checked, the small bottle was Php 605 and the large bottle was Php 1,075. The small bottle lasts 2 months while the big bottle lasts 6 months–at least for me. Oh, VMV, thank you for this wonderful, affordable product! Now you all know why I love this and why I can’t let go of it. Curious? Go to the nearest VMV store to check it out!